I have had this documentary on my watchlist for quite some time but I kept pushing it off to the side mentally because frankly, how good could a non-fiction film about some dudes playing arcade games be? Turns out it can not only be good, it can be really, really great. What really makes The King of Kong: A Fistful of Quarters work is the fact that on its side is a prototypical Hollywood fictional narrative, just set inside the world of old school gaming. 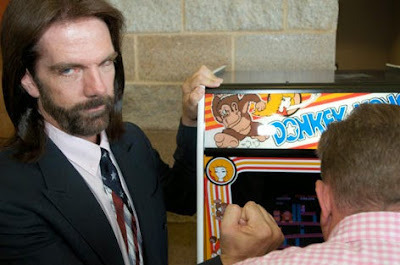 Billy Mitchell has been the king of arcade games for almost his entire life, setting numerous world records in the 1980's and he remains an icon of the gaming world in 2005. Mitchell is cocky, brash and sometimes rude, and he clearly doesn't want his records broken. He is the villain. 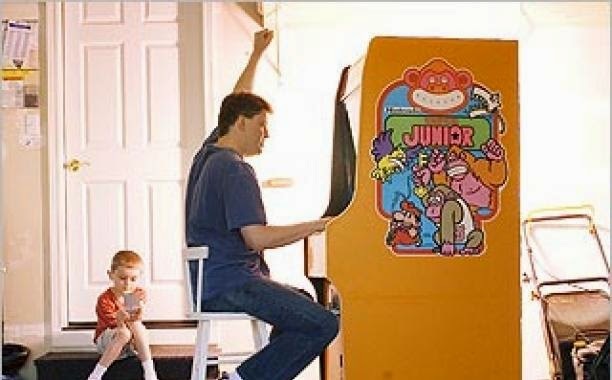 Across the country in Washington, a man named Steve Wiebe has recently been laid off from his job and he sets his sights on the Donkey Kong record score set by Mitchell as an achievement he can aim for. Sure, it's a way to pass the time but it is so much more to Wiebe, who has come in second place in everything throughout his entire life. He needs a win. His wife knows it. His children know it. They may roll their eyes at the amount of time he spends playing the game, but they still support him and even shed tears for him during his quest to set the record. It is impossible not to root for Steve Wiebe. He is the hero. This is a documentary that is funny, compelling, heartfelt, and is only 80 minutes long. Don't make the mistake of thinking this wouldn't be very interesting and ignoring the film like I did. The King of Kong: A Fistful of Quarters is terrific entertainment, and I'm betting you will be just as emotionally invested as I was. I saw this one a few years ago and also gave it 4.5/5. It is fascinating to see how dedicated/obsessed someone can get to something like a video game. ahhh glad to hear you have not only seen it but you enjoyed it just as much, I was actually going to recommend it to you. An absolutely fascinating doc. What I loved is that for both of them the game really represented so much more. For one it was an obsession of relevancy, as if Billy Mitchell losing that record would mean all he achieved 20 some years ago where as for Steve Wiebe it was more just the desire to be the best at something after a lifetime of falling short.